A pretty simple-minded movie that manages to pull off a plot we haven’t seen before, and really capitalize on it’s full potential for humor. If you can embrace the stupidity of the initial concept alone, then this movie is actually a lot of fun. It’s a film about adult men acting like kids, a genre that was once pioneered by actors like Vince Vaughn (Old School, Wedding Crashers.) Here, it’s taken to the next level. These guys aren’t just acting like kids in adult situations, they are acting like kids in kid situations. They are a bunch of adults who are engaged in an elaborate game of tag. We’re talking disguises, physical violence, psychological warfare, the works. And it turns out to be very funny. The movie might have a limited plot, but it uses every physical trick it can think of to get the laughs including freezing the action and putting it into slow motion at times, as well as employing voice over to help us get inside each character’s head. It works. As a guilty pleasure, fun movie, this one definitely pulls off what it set out to do. Tag is a movie that absolutely has one of the more interesting premises around. At least in terms of a one-liner intitial idea. That idea is about a group of adults who take one month out of every year to engage in a game of tag with each other. Apparently this is based on a real group of people. It definitely sounds like s lot of fun. And yet, how they make a movie out of that is anyone’s guess. They do do it by taking their time introducing us to each character and each situation. The ultimate story isn’t simply about the whole group of friends playing, but more specifically, it’s about a specific mission to take one of the friends. This friend is Jerry (played by Jeremy Renner,) and apparently he has never been tagged. He’s a mastermind at the game, knowing every trick and track, and resorting to whatever it takes to escape getting touched. And the movie goes a long time before we actually meet this character, which means there’s a lot of setup going on here. At the start of the film, we witness the first tag attack. 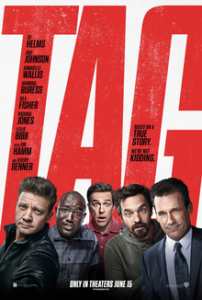 It’s not Jerry at all, but instead, it’s Hoagie (Ed Helms,) going after Bob, (Jon Hamm.) And in order to get that far, Hoagie has to resort to a lot. The movie opens with him interviewing for a job to become a janitor in an office building. The interviewer (Lil Rel Howery, from Get Out,) can’t believe that this man who owns his own business suddenly now wants to become a janitor. But Hoagie insists that he just wants to be the one to clean Bob’s toilet, and he manages to get the job. That leads to a scene where Bob is being interviewed for The Wall Street Journal, at the time when Hoagie attacks. First, we watch as Bob sits there for the interview and Hoagie impersonates a janitor in the background. And of course he drops everything possible, makes a ton of noise, and is absolutely terrible at going incognito. But he still gets the jump on Bob and tags him. And that leads to the two of them getting to talk. Hoagie is actually there for more than just to tag Bob. He’s there because that guy who they have always wanted to get, Jerry, is planning to quit the game. This is going to be his last year. Jerry is getting married, and has decided that after the wedding, he’s done with the game. That inspires Bob to join Hoagie in a pursuit of getting the other guys who play to all join forces with them in order to tag Jerry. And that’s pretty much the whole premise of the movie. The fact that it works is pretty amazing. One by one they get each of the other members of the group and tell them the plan. There’s the stoner burnout, Randy (Jake Johnson, better known as Nick from The New Girl show,) and Kevin, (Hannibal Buress,) a guy who has a lot of emotional problems. The guys get to him by hiding in the closet of one of his therapy sessions, hearing all sorts of things that they never wanted to know about their friend. There’s even Isla Fischer playing Hoagie’s wife, who is not allowed to play in the game, but certainly supports the guys doing it. Once the four friends are all rounded up, it’s time to make a plan. Jerry is getting married. They don’t want to tag him at his actual wedding. So that gives them a couple of days before the wedding to get the job done, at places such as Jerry’s house, or the rehearsal dinner. And in each of these places, Jerry is prepared and one step ahead of the guys. What makes all of this especially funny is the lengths that these guys, (especially Jerry) will go to in order to not get tagged. 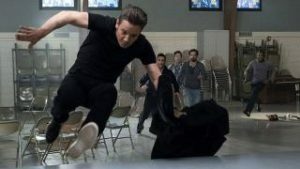 We’re talking about fights in the middle of a mall, scalling stacks of chairs, breaking windows and jumping out of them, and those are just the moments that don’t have major surprises (which can’t be given away here, without heading into spoiler territory,) in them. The plot features many more that really demonstrate how dark these characters will get. In a golf cart chase scene that ends up in the woods, Jerry even puts a boom box down so he can play a song to get to the characters psychologically before going on all out on them with traps. And that’s nothing compared to what his wife pulls off right around their wedding time. Let’s just say, nothing is out of bounds with these characters, and they absolutely take advantage of that. This is like the modern day Wedding Crashers, of movies featuring adult men acting like kids and having a blast doing it. And there’s something to be said for how much this movie embraces physical comedy. These characters aren’t afraid to hurt each other, and often do. Jeremy Renner, while performing one of the stunts, actually broke both of his arms. Here’s an actor who stars in all the Avengers movies, not to mention two Mission Impossible films, and one Jason Bourne movie. And it’s here, in Tag, that he breaks his arms. That tells you something. The movie really captures this physical humor to its full potential by using slow motion to both stop and start action. It plays with the pacing of character movement, and in the moments when it suddenly jumps to slow mo, we always get voice-over commentary to let us know what the characters are suddenly realizing. The brilliant thing about this movie is that there are practically no subplots. Any other film would feel the need to have a side story or background story, just to give this movie scenes to cut the main story with. With this film, the closest it gets is having a girl who once dated two of the friend, (played by Rashida Jones) show up at the rehearsal dinner and wedding to get those two friends thinking about her. But nothing really happens with this, and that’s actually a very good thing. At most, each friend has a brief conversation with her. Any other movie would have used it as an opportunity to have the friends start competing against each other for the girl, but this movie doesn’t allow itself to fall into that trap. It doesn’t allow itself to get distracted or start feeling generic at all. The ending might be the only time that things get a little corny and too neat, and when you think about it, the movie really had no choice. It needed to end with some kind of twist, and considering the basic nature of the plot, the options for this twist were limited. But other than that, pretty much everything here works. That includes having one of the characters, (the Hannibal Buress character, Sable,) not really into the game at all. He’s the voice of reason, the friend who goes along to comment on how ridiculous the whole thing is, saying things of Jerry like, “our friend is a psychopath.” But Sable has his own things going too, like his deep pondering over meaningless ideas, “why does biweekly refer to both twice a week, and also every other week? It’s just confusing.”Buress, being a great stand up comic, actually pulls this material off. And that what is so great about the movie. That it actually works. There’s nothing brilliant about this movie, other than how basic the premise is, and how despite that, it is actually a lot of fun. This movie has potential to become a great guilty pleasure film, and it is already on the right path to achieving that goal.